This week on In A Pavilion: The week's up and I'm back in Berlin, having had two first days at my two new jobs. Yes, you heard right – I have not one, but two new jobs. I'm excited to say that I'll be the communication manager at muun, as well as the social media manager at Eating with the Chefs. Both brands are Berlin-based and have some exciting stuff in the pipeline, which I will update you on in the following weeks. For now, enjoy this week's roundup of my favourite links. Talking about my new job at muun, you can currently win one of their super soft mattresses by entering this Elle Germany competition. Good luck! That Grace Girl kickstarts a new series on her blog: The Almanac. First up, she tries out Charlotte Tilbury's 'The Sophisticate' range and shares a beautiful photograph of herself. Another note on beauty by That Grace Girl all about on-the-go beauty staples, which will most definitely come in handy now that I'll be returning to office life. Hannah-Rose Yee reviews Us by David Nicholls for In Bed's Journal. Gotta love a bit of Matthias Schoenarts: Interview publishes a conversation between Tom Hardy and cinema's current star. While many of us think about food a lot and buy all the latest health food books, By Her Mirror reminds us about the ensuing complications. You all know I like Apiece Apart's portraits, so it will come as no surprise that their latest one on London designer Gemma Holt (who happens to be designer Max Lamb's wife) ticks all the boxes for me. I'm always on the hunt for Berlin's best breakfast spots so Stil in Berlin's latest series based on the day's most important meal will definitely come in useful. First up, quick and easy spots. (German) Für alle, die die Pille nehmen: moderne Antibabypillen haben größeres Thromboserisiko und sollten nicht als Lifestyleprodukte vermarktet werden – Zeit Online berichtet. BBC Radio 4 celebrates 5 scientiests who changed the way we see nature. Bon Magazine's feature on young fashion brand Vetements is well worth a read. (German) Für This Is Jane Wayne teilt Teresa Köster ein paar Bücher, die großen Einfluss auf sie ausgeübt haben. Toller Artikel, danke Teresa! Photographer Yuvali Theis has shot campaigns for Charlie May and Harrods and also has a great Instagram account you should check out. | Kenny Hurtado has just updated his Tumblr and his photos make me yearn for a vacation in America. 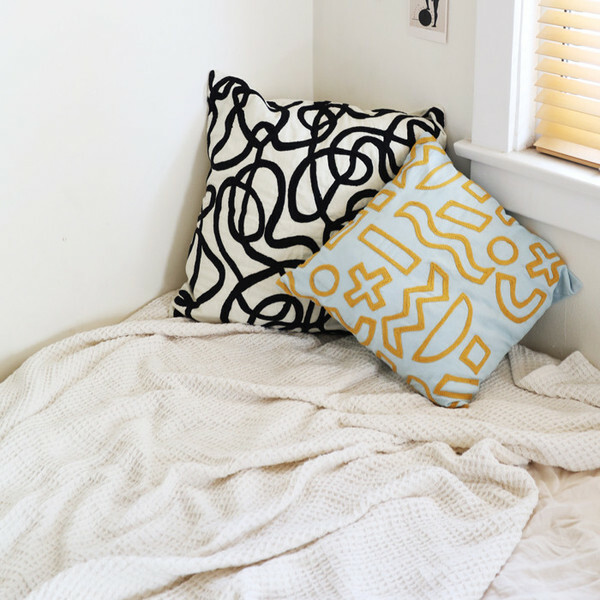 | Dusen Dusen's cute embroidered pillows would liven up any sofa or bed, as seen on Kooye. | Introducing new German shoe brand aeyde, manufacturing leather shoes that are both timeless and of good quality. The new album, What Went Down, by Foals is surprisingly good and kept me upbeat throughout my really annoying cold. Thanks to Anna aka By Her Mirror, I've been listening to the Drive soundtrack all week. Especially College & Electric Youth's A Real Hero has resulted in me dancing around the apartment. That's it for this week – make sure to head out and get some crunchy leaves under your shoes!